The first Parents as Teachers sites started serving families in St. Louis, Missouri in 1981 with the belief that parents are their children's first and best teachers. The Parents as Teachers model has since grown, serving families in all 50 states and six countries. Service has also expanded to include children from the prenatal period through Kindergarten. From its onset, the Parents as Teachers model has focused on identifying developmental and health delays, and providing parents with the knowledge and tools to support child development. Here you will find general information on the Parents as Teachers model and the Texas Parents as Teachers State Office. Much of the information below comes directly from the Parents as Teachers National Center website. Learn more at www.parentsasteachers.org. 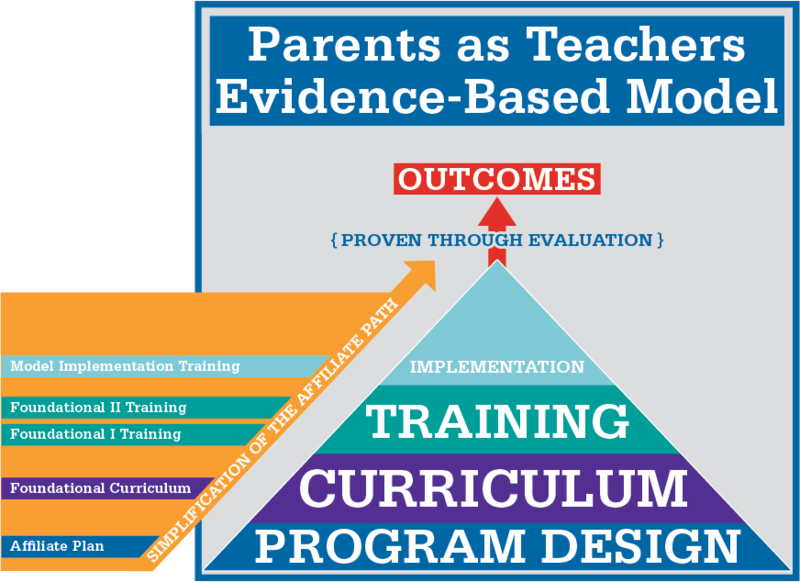 The Parents as Teachers logic model is the theoretical framework the program uses to create positive outcomes for both families and children. It starts with the values and goals of the program on the left hand side and then to the activities that work towards those goals and eventually the outcomes that reflect the goals. The Texas Parents as Teachers State Office provides support to all sites within the state that utilize the Parents as Teachers model. State Office staff assist sites in program initiation, quality assurance, fund procurement, and advocacy. The Texas Office also acts as a liaison between affiliate’s funders, the Parents as Teachers National Center, and the affiliate. The Texas State Office Role Guide provides valuable information on the various components of each position within the office. Each state may have different staff roles and responsibilities depending on the design. To learn more about the state office staff see the About tab. Below is the Parents as Teachers Stages of Implementation Diagram demonstrating the various steps sites go through to establish service and the components that make up those steps. 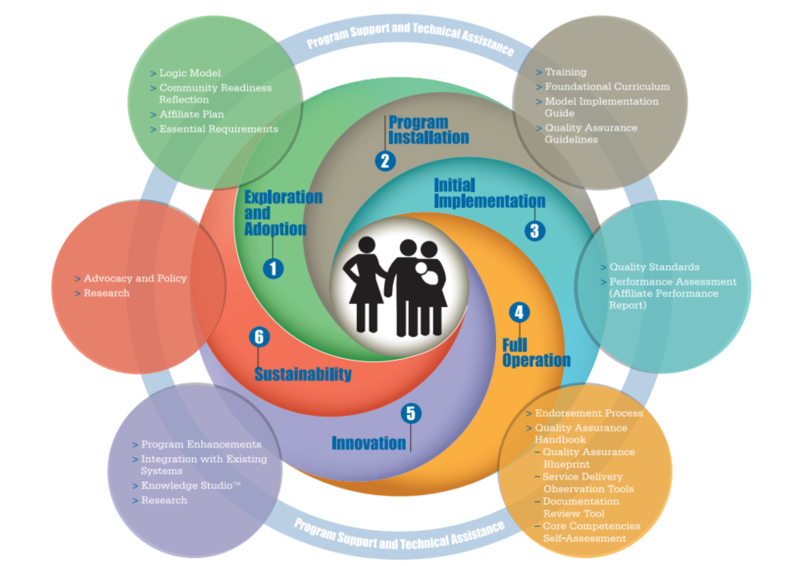 The Texas Parents as Teachers State Office assists sites in each step of this process and is represented by the light blue ring surrounding the core circle (titled Program Support and Technical Assistance).